Initially when a person takes up a certain job, they may not be expected to get a salary which will be high enough. It will be considerably low as they may not have enough experience at the start but they should know ways to negotiate their salary. The more unique the job is, higher should be the salary expected for it and for that they need to negotiate a high salary. When the person takes a look at themselves and what they are worth to the company, automatically they come to know high of a salary they should expect. So before going to the path of negotiating for a higher salary, there are certain things that the individuals need to keep in mind with some of the suggestions mentioned below. Before asking for a higher salary, the person may feel reluctant to do so. This may be for reasons such as having low self esteem or lack of self confidence. But facing all these problems have to be done by the individual if they want a higher salary. There might be a good deal in favour of the individual for their salary package but these will be the obstacles in their way. The best way to move forward is by leaving all these negativity behind. Fear is one of the most common things that come in the way of the individual. The person may have the fear of being rejected when they ask for a higher salary. They also may have the fear of facing some kind of resentment from their boss. This is the person’s biggest weakness of living in fear. So the sooner the person faces this kind of fear, the faster they can go past it. Mentally the people need to get this fear out of their head so that they are financially satisfied. Excuses such as telling that this salary is sufficient enough and the person doesn’t need more will come across the mind of the individual. If these excuses start coming in the mind of the individual, then they can never ask for a higher salary ever in their life. These excuses should never be tried or executed ever by a person if they want a bigger salary package. The individual should know that they deserve more than what is being offered and stand up for themselves. Though it may sound strange but to some aspect this can be used as a technique for getting a higher salary. A person should always be thoughtful and humble from time to time. But especially when a person wants to see a better life for themselves and their family, they shouldn’t be so humble while negotiations are going on. This may be due to reasons personally and professionally which doesn’t show a good sign of any humility. With this, do not bear any unnecessary guilt of others. A person may have also negotiated for a higher salary in the past and it wouldn’t have gone so well for them. But now in the present, when such an event occurs the person shouldn’t think about such a past event. Though it still must be troubling the person, the main reason would just be because they let it in their lives once again. The best way of forgetting about such an event is simply not to care about it and try hard to negotiate for the highest salary possible. Before having the idea of having a higher salary, some people have false thoughts about lives of such people. They start to think that such rich people have a greedy and negative behaviour in their life. They even think that such an attitude can ruin relationships between peers and co-workers. But they should realize that they are much better than turning into such individuals in their life and so they should stop thinking or believing in such strange notions happening in their life. After thinking of what the person needs to say, they need to speak up for themselves so that they can be heard. Their employers aren’t mind readers to know how much of a higher salary do they expect. There are only two possible answers that can be said, yes or no. If the person doesn’t speak up for themselves, they can open up a door for someone else to get the higher salary. Also after they take up such a bold move, they can understand their current situation in their workplace. If the answer turns out to be no, the person should know how they should react. They should know that this answer was made strictly on a professional basis and nothing personal. The person should know that they have finally stood up for themselves. If they react in a negative way, they may have a problem in the future. They may not be under consideration for any kind of increase in their salary in the future, if they react in a negative way now. Though the issue of getting a higher salary is a personal thing to the individual, for the company it is impersonal. So this kind of a request should be taken like a business transaction. But on thinking this, the person should not confuse their professional worth to their personal worth. Recognize that a renegotiation is possible if things may have not worked out at first. These can be very effective if the person wants to get the highest salary possible in the workplace. If a person has a feeling of getting nervous before speaking about them, then they can practise before approaching their employer in person. This will help the individual get a better understanding on the art of negotiation of a high salary. A person can practise by standing in front of a mirror and reasoning out their opinions in a loud way. They can also have a friend who acts like the boss and ask them to respond accordingly as they speak to them. By doing this the person understands what their professional worth really is in the workplace. By knowing this, they can understand whether or not they should expect a higher salary or not. A person can expect a higher salary on certain things such as the experience they possess in their field along with their educational background. They should also see how better are they engaged with their clients along with how much better knowledge do they have of their employer. Without doing all the necessary research, none of the valid facts can be negotiated at the time when high salary negotiations are taking place. So the person should do research on certain salary guides. They can even ask their former bosses or any possible mentors as well as their colleagues for any necessary information. For the role currently being performed by the person, they can even look what other employees in the company are being paid for and then they should act accordingly. 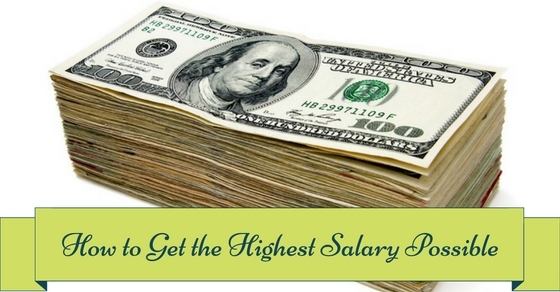 Initially asking for a higher salary, the person should let their employer know about it. Then the employer reacts in a way and makes the person such an offer. In order to properly react, the person should already have a specific salary range in their head. Knowing this they can set a counter offer to the employer and they can be prepared in a much better way for such a situation. After everything has been done, then the person can ask for their final offer which could be closest to their highest salary possible for them at that moment. After the person has knowledge of all the valid facts present, then they start being realistic towards their salary for the job. After completing their entire research, then they have a better understanding about what their highest salary may be for this job. They start to realize that this job is important and they shouldn’t push their employer higher and higher for an invalid salary. On doing this, slowly they will find what they are looking for in the workplace and then they can get their highest salary. When an offer has been made by the employer, then the person if not satisfied should ask for an entire detailed break up of the compensation package. They should ask for it in writing from their employer so that they can know that with their salary package what other extra benefits they are going to receive. After receiving all this information, if they are not satisfied with the salary package offered, then they can include such benefits in their counter offer which is as good as money. Before making an offer for the higher salary the person should always show their greatest interest for their job. They should show that they are determined to achieve success. With this the employer will show its determination for work and in turn that is what a company wants so it’s a win situation for the party therefore showing interest will increase the higher chance of getting the job with a nice expected package. While in an interview a HR looks for a candidate who is smart and the right person for the job but at the same time they also look for a candidate who has a reasonable price to offer. If the salary expectation is more than what the HR margin line is then the company will try to withdraw the candidate even though he/she has high credentials. Therefore it is always better to evaluate and study what the company has to offer and according to that the package should be forth to the associate and then if your package is reasonable then they will accept and give you the job with sufficient salary. Just asking for a higher salary will not give a chance of getting a job. One has to give a strong reason why you deserve such a good and reasonable package. A guy with no credentials will be treated not as a valued candidate and will not get the job and also there will be no question rising of getting a highest salary. So to get the highest salary one has to show its worth as to why he/she deserve such a higher salary package by showing his experience, education, skills etc. In this market it is not possible to just get a job easily so to ask for a higher salary is far more difficult. An individual has to know what is needed to achieve such a fit and desired job. Just because he wants a job and a higher salary because of some personal reason will never land with any job in life. One has to struggle to achieve and earn such high salary paid job by having experience; a great degree in respective stream in a famous university will increase the higher chance of getting the job and a high salary package. After getting the job one should get the offer in writing so that if the candidate leaves the current job and goes for another job that will be proof and a higher chance of negotiating on the salary package. A person should also know how to negotiate salary and if he is pro in that then getting a higher package will become a easy job and also will be happy and motivated at the same time about giving best at work.